Services - Fitzgerald Environmental Associates LLC. ﻿﻿﻿Supporting sustainable land use management through river corridor and transportation planning and engineering to improve compatibility between road and river networks; river and floodplain restoration designs to mitigate flood and erosion risks for built infrastructure in towns and villages; and river corridor restoration projects that result in the least erosive river conditions. See flood resiliency planning and design projects here. Phase 1, 2, & 3 Stream Geomorphic Assessment (SGA) surveys following Vermont Agency of Natural Resources (VTANR) protocols. River Corridor planning and outreach in conjunction with regional and municipal governments. Fluvial Erosion Hazard (FEH) analysis in context of town zoning and master planning. See geomorphic and habitat assessment projects here. Integration of a diverse toolset including detailed field surveys, spatial analysis (GIS and CAD) and hydrologic and hydraulic modeling (HydroCAD, HEC-RAS, Flo2d) to analyze river discharge and sediment transport as a basis for natural restoration design. Permitting for river and floodplain projects under VTANR and Army Corps of Engineers jurisdiction. See river restoration design and permitting projects here. Rainfall-runoff modeling (NRCS methods) for design and sizing of stormwater treatment systems. Pollutant loading analysis per Vermont Agency of Natural Resources (VTANR) Stormwater Manual and Engineering Feasibility Analysis (EFA) procedure for offsets. Certified inspections of erosion prevention and sediment control practices for construction and post-construction phases. See stormwater project examples here. Wetland delineation and functional assessment per Army Corps of Engineers methodology and VTANR Wetland Rules. Integration of wetland delineation, GPS and GIS services for a comprehensive approach to mapping and permitting. See wetland delineation and permitting projects here. 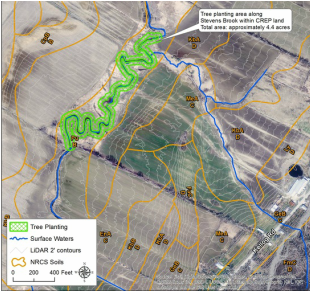 Mapping of natural and man-made landscape features using publicly available base data and data collected through high-resolution GPS and GIS software. Integrated analysis of GIS and GPS data with watershed modeling software allows for efficient data processing. See GIS and modeling projects here. See shoreline stabilization projects here.